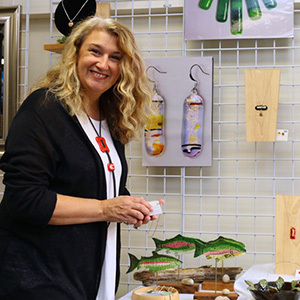 Kate Studio embodies artist Kath Piros’ jewelry line, paintings and all things artsy-craftsy that she loves to create in her Bellingham, WA studio. A life-long artist, she has been taking art classes since she was 5 years old. Kath is passionate about teaching children and adults and continues to take professional courses in painting, fused glass and metalsmithing. She loves to make bold statements in glass and other artwork, and is influenced by fashion, the beauty of nature and her family life. A Canadian who spent the last 20 years in Silicon Valley, CA, Kath moved to Bellingham last summer to be closer to her roots. Hauling up the kiln, a mountain of glass, and a bucket of paint brushes, she set up her own Kate Studio for art workshops and classes, and a venue for creating her own art. Kath’s artwork was nominated for one of Martha Stewart “American Made” awards, appeared on San Francisco-area fashion runways, sold in San Jose stores and at both the Jansen Art Center and Santa Clara Museum.